10 Quick Checks /$100. per month/20,000 total numbers checked. Our Multi-User Quick Check service is perfect for Remote Agents, Virtual Call Centers, Bank Branches, Mortgage Branches, and Insurance Offices. Although it’s designed for maximum Do Not Call Law Protection, Quick Check requires no scrubbing expertise, and is a breeze to use in everyday selling. Just enter numbers one at a time or up to 100 at a time, press enter, and you’re done. Quick Check includes an administration dashboard, so you’ll know what each agent is checking. Each lookup is archived and dated in the format and timeframe the government requires should you have a problem. This service is backed by our top Do Not Call compliance provider, the same people who do data hygiene for the National Do Not Call Registry and provide certifications to the Professional Association for Costumer Engagement (PACE). Our Multi-User Quick Check program can be quickly deployed as an Internet- or intranet-based solution for your frontline teams communicating with consumers and other businesses. Don’t be fooled; the government considers anyone who uses a phone for business a “telemarketer.” Federal law states you have 18 months to communicate with a consumer from the date of purchase of a product or service. State laws are usually even more restrictive. Quick Check checks for that. According to federal law, you have 90 days in which you can respond to consumer call-ins. But her too, more restrictive state laws are coming on strong. Quick Check checks for these, as well. And don’t forget: Five states don’t allow calling cell phones without written permission at all, even by hand. Our new updates have you covered there, too. To learn more about the Do Not Call Multi-User Quick Check service, call me now, on my direct line (561-317-3001) to discuss your situation. Special Note to B2B Business to Business callers: Smart predatory attorneys are aware of the cell phone law changes on October 16th, 2014 - and know you're probably not! (Cells are neither consumer nor business now - just cells!) In other words, you're easy pickins' for professionals looking to litigate over your unchecked cells from social media sourced lists: Is the cell on the DNC list? If not, you'll still want to call cells by hand dialing. Quick Check is perfect for the extra layer of protection and recordkeeping required today for safe communications for your B2B calls. 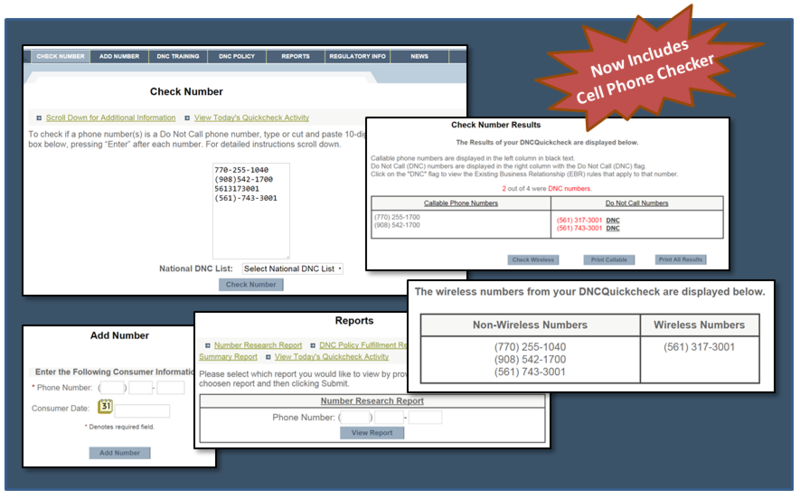 You'll need to get registered with the National Registry www.telemarketing.donotcall.gov but that's FREE. Why Outsource DNC TCPA Compliance for your Agents? Why Companies do not off an Agent DNC TCPA Compliance Solution?